The 2018 Lincoln MKT offers a comfortable interior for seven passengers, tons of luxury equipment, an available twin-turbocharged V6 with plenty of power, and a measure of utility that's hard to find even in the luxury-sport-utility market. Yet the styling's bulbous proportions, old-style Lincoln winged grille and unique rear styling continue to turn off more potential buyers than they turn on. The 2018 Lincoln MKT comes with a lot features you expect in a luxury-crossover SUV, including a powerful V6 engine and room for up to seven passengers. It also can cost considerably less than many of its competitors, sometimes by thousands of dollars. The Lincoln MKT's styling has been a lodestone since it debuted, with the big grille, weird rear end, and bulbous look never catching on. The rear-seat headroom is also tight for tall passengers, and its size means it's hard to maneuver in parking lots. No major changes this year, with only a change in a few paint colors marking the model changeover. The 2018 MKT boasts a spacious interior that's easily competitive on space with other large 3-row luxury SUVs. Front and middle-row passengers are treated like royalty, with plenty of leg-, head- and elbow room, and a touch-screen infotainment system. The third row isn't quite as spacious, and should be reserved for kids or smaller adults. You can replace the 2nd-row bench with heated and cooled captain's chairs, and even outfit the MKT with a refrigerator between them. The big windows give the driver and passengers a commanding view outside, and the seats fold quickly for a flat floor and generous cargo space. Surprisingly, the bulbous and curvy Lincoln MKT shares its underpinnings and chassis with the boxy Ford Flex. While the Lincoln is certainly eye-catching, we'll let you decide if it's pleasing or punishing to the eyes. Let's just call it "distinctive," especially the massive winged grille, the squinting headlights, and the oddly kinked droop of the side-window line. The massive hatch gets gracelessly bisected by the long wide taillights. At least the hatch is powered, and we'll admit we like the big panoramic sunroof. When equipped with the potent twin-turbocharged 3.5-liter V6, the 2018 Lincoln MKT has no problems with acceleration, passing or merging. Yet dial it back and just relax, and the MKT proves itself to be a good cruiser, with a comfortable ride, nicely weighted steering with good feedback, and strong brakes. If anything, the base model is too soft and leans too much in corners, but the EcoBoost models with all-wheel drive get Lincoln Drive Control, which firms things up. LDC also offers modes for Sport, Comfort and Normal throttle modes, but it's hard to tell the difference. The excellent 6-speed automatic is a good match for both the turbocharged and non-turbo engines, boasting quick shifts on its own or when using the steering-wheel-mounted paddle shifters. Since there's no around-view camera like you'd get on an Infiniti QX60, we strongly recommend the rearview camera and parking sensors. The least expensive 2018 Lincoln MKT features the non-turbo engine, front-wheel drive, and carries a Manufacturer's Suggested Retail Price (MSRP) tag just under $44,500, including the $925 destination charge. If you want the extra power from that EcoBoost engine -- and let's face it, you really do -- you'll need just under $50,000. That's a big step, but it adds all-wheel drive and more luxury features. A fully loaded Lincoln MKT can run right about the $60,000 mark, splitting the difference between luxury-SUV models as the Buick Enclave, Infiniti QX60 and Acura MDX on the lower end, and the BMW X5 and Audi Q7 on the high end. Before buying, check out the Kelley Blue Book Fair Purchase Price, which tells you what others in your area paid for the MKT. In the long term, we expect the MKT's resale value to be lower than that of its competitors. Even the base-model 2018 Lincoln MKT comes nicely equipped, with leather on the first and second rows, 3-zone automatic climate control, heated and cooled driver and front-passenger seats, heated 2nd-row seats, a rearview camera and a power tailgate. The steering wheel features power tilt-and-telescope adjustment, which along with the power-adjustable pedals makes it easy for drivers to find a comfortable driving position. The standard audio system offers 10 speakers and AM/FM/CD/aux inputs, all controlled via the touch-based Sync 3 system and 8-inch screen. Get the EcoBoost engine and you get standard all-wheel drive, Lincoln Drive Control adjustable chassis dynamics, and more. The easiest way to load up the 2018 Lincoln MKT is to select the EcoBoost-equipped version. That adds things like a heated steering wheel, navigation system, THX II audio, and a dual-screen DVD rear-seat entertainment system. You can replace the 2nd-row bench with two captain's chairs, and even put a refrigerator between them. Also available are a panoramic roof and a power-folding third row. Available active-safety features include adaptive cruise control, lane-keeping assist, and blind-spot monitoring. There are also inflatable seatbelts available for the second row. We like the Active Park Assist, which performs the bulk of parallel parking for the driver. Considering the MKT's size and weight, the 365-horsepower twin-turbo V6 engine is a no-brainer. It costs about $4,500 more than the base model, but comes standard with all-wheel drive, additional luxury features, and virtually no fuel-economy penalty. It's a shame the MKT's exterior is such a barrier, because the interior is quite nice. The seats are handsome, and the dash and control layout is both attractive and easy to operate. You can even get a refrigerator between the 2nd-row captain's chairs, and a power-folding third row. The base-model 2018 Lincoln MKT gets a naturally aspirated 3.7-liter V6 powering the front wheels (FWD). It puts out 303 horsepower, which results in okay acceleration and passing power, but isn't particularly exciting. The better option is the twin-turbocharged 3.5-liter EcoBoost V6. With 365 horsepower, 350 lb-ft of torque, and standard all-wheel drive (AWD), the EcoBoost works perfectly for the luxury-equals-power crowd. Either engine comes with a 6-speed automatic transmission with manual-shift mode. Both engines can run on 87-octane gasoline, but Lincoln says you should use 91 octane in the EcoBoost for best performance. EcoBoost versions can be equipped to tow up to 4,500 pounds. 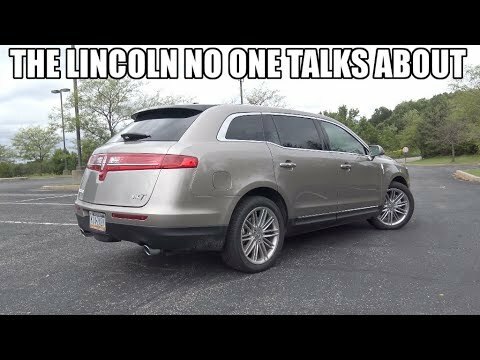 The 2018 Lincoln MKT still boasts the same odd proportions, overwrought Lincoln winged grille, and peculiar rear-end styling that have proved unappealing to the general public. Yet behind this Lincoln's styling turnoffs is a vehicle that actually offers some advantages in the luxury-crossover-SUV space. It can seat seven passengers comfortably, and there's generous cargo room behind the snug 3rd-row seats. You can order the MKT with the much praised 3.5-liter twin-turbocharged EcoBoost engine. Unlike the Land Rover Discovery or Lexus GX, the 2018 MKT is not meant to be an off-roader, its available all-wheel drive geared more toward foul-weather situations. Instead, think of this big Lincoln as a competitor to luxury SUVs like the Acura MDX, Infiniti QX60 and Buick Enclave. The car adjustment presets do not work - they are unable to be overridden. When pressed the driver's seat either moves as close to the steering wheel as it can or goes down as far as it can. This could be an issue because I have not found a way to stop it once I press the button. The car sensors when driving are very sensitive and often inaccurate - it will beep when I am going up my driveway just because it senses the concrete.